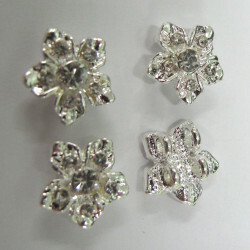 Diamonte spacers There are 3 products. Diamonte style 2 hole spacer. Pack of 3. Diamonte style 2 hole spacer. Pack of 3. Central glass stone surrounded by 8 smaller stones. Great AB sparkle. Approx 14mm. Diamonte Style 2 Hole Spacers, Pack of 3. 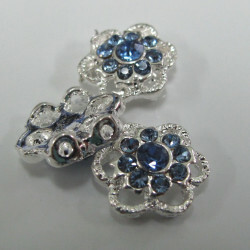 These have one central glass stone and 8 smaller stones to give lots of sparkle. Size approx. 14mm. 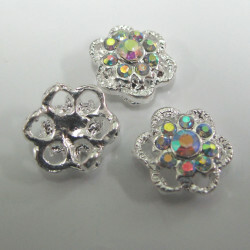 RN1837 - Flower 2 hole spacers, clear stones. Pk of 4﻿.